We understand how difficult it can be to build a follower base on Instagram from scratch, especially given how competitive things have gotten on one of the world’s most popular social media platforms. However, that’s no excuse to buy thousands of followers in the hopes of getting a head-start, because you definitely won’t. But you may very well run into several issues that may ruin your chances of building a brand on Instagram if you buy fake followers. Here are a few reasons why. While it’s pretty obvious, many users may still don’t know that buying followers and/or likes is against Instagram’s terms of service (TOS). And Instagram is actually pretty stitch about it, as it suspends and bans countless accounts from time to time for doing these things. Needless to say, you wouldn’t want to lose your account that you spent so much time and effort on, just for a short-term boost in numbers (of your follower count) that actually won’t even translate to any kind of real engagement. Something most users might not know that these days the follower count isn’t the most important metric for judging the success of an Instagram account. Instead, it’s the engagement rate. So for instance, if an account with 100K followers is getting like 250 likes per post, then the engagement rate is terrible and not many would really like to work with such influencers or brands. Further, Instagram’s algorithm takes the engagement rate pretty seriously, which means that if you have a bad engagement rate, it can greatly hurt your ability to reach targeted users in your niche. If you’re a business, you probably don’t need to be lectured on the importance of brand image for any business. And the problem with buying fake followers on Instagram is that it’s one of the fastest ways of building a poor brand image. After all, no potential customers or followers would like the fact that the business they are looking to work with or buy from uses shady marketing tactics like buying fake followers. While the average customer is no social media expert, it wouldn’t be difficult for active users on Instagram to tell whether a particular business is artificially boosting their follower count. This is especially given that all those accounts that end up being your “followers” scream of being fake, as they usually have no activity and, in many cases, no profile pictures either. We never give you fake, inactive, or ghost followers as this will do more harm than good. What we do is find users who would be interested in your Instagram page and engage with them to get them to become aware of you. 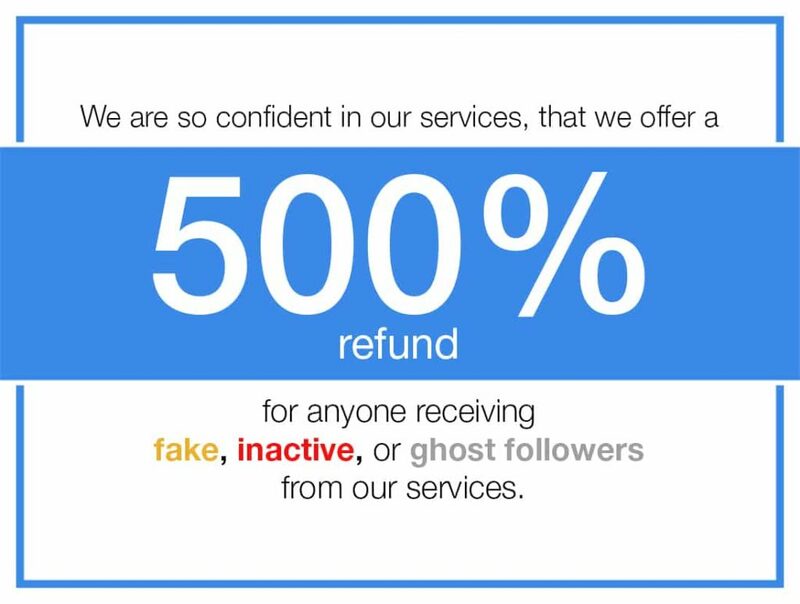 If you receive fake, inactive, or ghost followers from our services we will give you a 500% refund!